When it gets cold out, you need heat! Even though it doesn’t get as cold in Burleson, TX as it does some other places, it definitely gets chilly enough to turn on the furnace. If you’re not as warm as you’d like, give Lightfoot a call. We’ll come out and get your heater working in no time. The air coming out of your vents isn’t warm, or isn’t warm enough. The air blows weakly out of your vents. The furnace goes on and off frequently. You utility bills are significantly higher than expected. Water pools around your furnace. All of these are indications that it’s time to have a professional come look at your HVAC system, before it stops working entirely. When you call us, you won’t have to freeze for long. We’ll get someone out to you as soon as possible to assess your unit and let you know how you can get your heating repaired and back to normal quickly. Sometimes, your furnace just needs a tune-up to function well again. Regular maintenance includes things like changing your filters, removing dust and debris from the unit, and making sure your pilot light is functioning well. If you haven’t had this done for a while, it may get your heater working to your standards again. Changing the filter on your furnace is usually easy, and should happen every month or so, depending on the type of furnace and the filters you buy. Check your manual to learn how to do this. If you lost the manual or it wasn’t passed on to you by your home’s previous owners, look it up online using the make and model of your unit. You can also have one of our techs come out. They are trained to work with all types of furnaces, and they should be able to show you how to do a filter change. Problems with the ignition (in an electric furnace) or the pilot light (in the gas version) are also common. If the furnace cannot turn on, then it cannot heat your home. These aren’t problems that you should attempt to diagnose or repair yourself, because a mistake could be disastrous for your home and your family. The thermostat on a furnace can also go bad. This can lead to all sorts of problems. Sometimes, the furnace won’t turn on at all. Other times, it won’t shut off. Sometimes it cycles on and off repeatedly in a short period of time. This is usually a repair that needs to be performed by a professional. 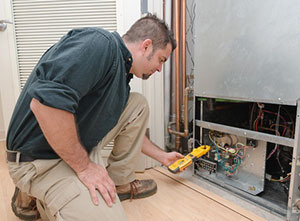 No matter the type of heating repair in Burleson TX, Lightfoot can get it done. Our skilled technicians will get everything back up and running as soon as possible, so you can stop worrying, get warm, and enjoy life again. Call us at the first sign of furnace troubles and we’ll make sure you’re warm for the rest of the winter.